LEXINGTON, Ky. (WKYT) - It is a game they both love to play. 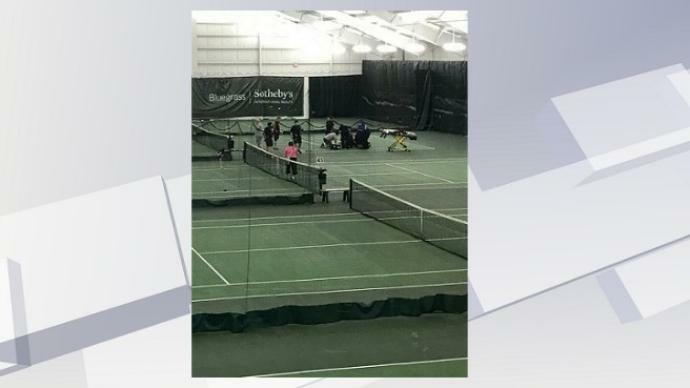 "We were having a heated match back and forth, with momentum swings and we were in a third set tie breaker," Dr. Hal Skinner, a Cardiologist at Baptist Health said. That Monday night match at the Lexington Tennis Club turning into a life saver. "Out of the corner of my eye I saw Paul go down, I just assumed he just stumbled and tripped but then he was laying face first and he wasn't moving," Dr. Skinner said. Those around the court running over to help, including Dr. Skinner, who was facing against Paul McElwain at the time. "We rolled him over and he wasn't breathing, I checked his pulse. He didn't have a pulse so I knew it was a catastrophic heart event so I started CPR," Dr. Skinner said. The heart just so happens to be Dr. Skinner's specialty, he quickly grabbed an automatic external defibrillator he remembered seeing in the building. "As soon as I shocked his heart he had a good pulse but he still wasn't responding." Though he managed to restart his heart, Mcelwain needed to be shocked about three more times as paramedics rushed him to Baptist Health. Dr. Skinner then met them at the hospital to join in on an emergency procedure. Mcelwain, now with a defibrillator in his chest, was well enough to go home just three days later. "What's the chances that you are going to have that kind of event across the net from a cardiologist, in a facilitiy with an automatic external defibrillator," McElwain said. Doctors at Baptist Health agree this is an extraordinary case of right place at the right time for everyone involved. Dr. Sandeep Duggal, one of Mcelwain's doctors, and a electro-physiologist, says without a doubt Dr. Skinner being there saved his life as well has having an AED nearby. "We see this a lot unfortunately but most of the time I'd say the majority of the time we see people by themselves or at home and the results are not as good," Dr. Duggal said. "Without that, even with me being there, a cardiologist doing CPR, you only have a limited time not getting proper blood flow to the brain. About 5 minutes without permanent brain damage," Dr. Skinner said. "Every bit of that contributed to me sitting right here and that they're not burying me," Mcelwain said. A sobering thought, but it is a story he's happy he's here to tell, and thankful to now have some friendly competition talking about that life saving match. "Pretty comfortable we were going to win, I think Paul was afraid they were going to lose so he just flopped down on the floor," Dr. Skinner said.